Bengaluru, Feb 10: Chief Minister H D Kumaraswamy-led Karnataka government’s move to introduce NRI quota and hike fees in government medical and dental colleges has evoked protest from medical and dental students in the state. 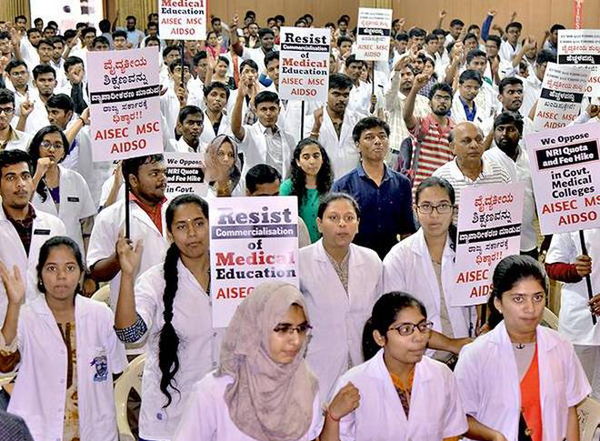 The Medical Students’ Struggle Committee, Dental Students’ Committee, and the All India Democratic Students’ Organisation convened a State-level convention demanding that the government withdraw the proposals. Most students felt that introducing a 15% NRI quota in government colleges would deny meritorious students a seat in medical and dental fields. Mohammed Kalandhar, a second-year medical student, said many students who come from low socio-economic backgrounds toil hard to obtain a government seat. “The families of many of our batch-mates have taken loans to pay the fees. If it is hiked further, pursuing a career in medicine will be a distance dream for them,” he said. Madhusudan Kariganur, Karnataka State president, Indian Medical Association (IMA), too opposed the move. The Indian Medical Association will stand by the students till their demands are met, he added.